I love Saturdays at my house. Typically we sleep in, then I get up, pop some cinnamon rolls in the oven, and proceed to watch The Food Network all morning long. I know, Heaven right! 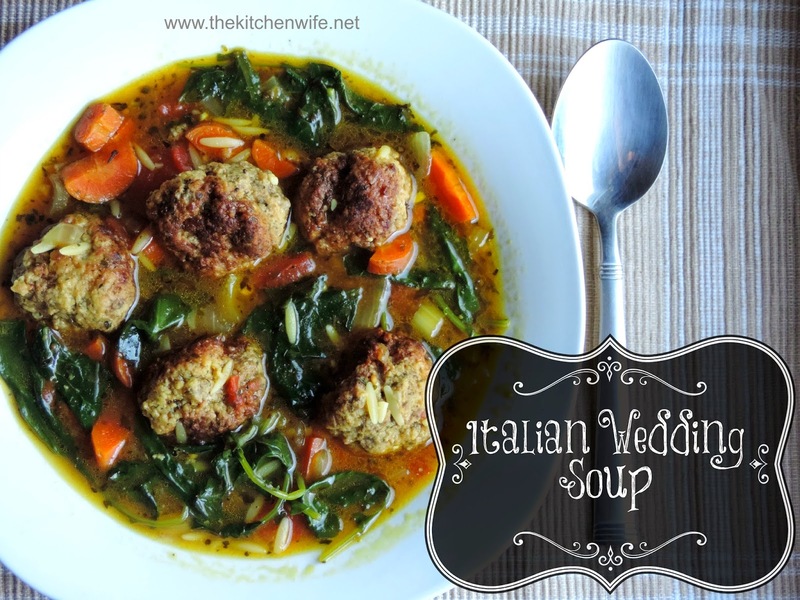 Anyway, while I was watching this past Saturday one of the hosts were making Italian Wedding Soup. I have to admit that I have never had this soup before, but it looked amazing and I knew I wanted to try it. However, being a food blogger myself, I didn't want to hijack their recipe so I decided to do a little research of my own and create this dish using my touch and my kitchen. This may not be a tradition "minestra maritata" (married soup), but these flavors definitely marry to make one hearty and delicious meal PERFECT for any fall table! The first thing you will need to do in preparing this soup is make the meatballs. Obviously you can use frozen here, but I think that making them from scratch just makes the soup that much more special. To a mixing bowl combine the ground beef, bread crumbs, grated Parmesan, egg, milk, garlic powder, parsley, oregano, basil, salt, and pepper. Gently mix with your hands until everything is combined. Next you will for the meatballs. I like to use a cookie dough scoop, but if you do not have a cookie dough scoop, think golf ball in terms of size. The recipe should yield between 24 and 27 meatballs. This next step is completely up to you, but I feel that it help the browning step of the recipe go a little smoother. I like to put these meatballs in the freezer for about 30 minutes. It helps the meat to set and the meatballs to be easier to handle. While your meatballs are in the freezer, you can chop up the rest of your veggies, measure out your ingredients, open your cans, whatever you need to do to help you along in your cooking. Then, place a soup pot over medium/high heat and pour 3-4 tbsp. of oil in. Allow the oil to get nice and hot. Now you are ready to brown the meatballs. I say brown because you will not be cooking these all the way through, just searing the outside. I like to do them in 2 batches. This way I don't crowd the pan, and I am able to get a nice crust. 2-3 minutes on each side will be perfect. Remove the meatballs from the pan and set to the side on a plate. Now to that same soup pot add the onions and celery. Allow them to cook until they just start to soften. Now add the carrots and garlic. I cook these a little longer. I like to get a little caramelization on my carrots. At this point, if I am using dry, I like to add all of my spices to the pan. I do this because I have no idea how long they have been sitting on that shelf in the grocery store and they made need a little waking up! Add the Turmeric, Basil, Oregano, and Parsley to the pan. Let this cook for just a minute or two. I will say that turmeric is not a traditional spice used in Italian cooking, but I love using it in my chicken stock based soups for the beautiful, bright yellow color is gives. In this quantity the impact on flavor will be minimal. Here is where I add the white wine. I love the bright flavor that it gives this soup, but if it bothers you simply leave it out. Pour the wine into the pan and let it reduce by half. Do you see how bright and yellow the turmeric makes the broth!?! Bring the pot to a boil, drop to a simmer, and cover. Let the soup cook for 30 minutes. What happens here is the meatballs will finish cooking and all of the flavor that you have built in this pot is going to come together or "marry" into one AMAZING pot of soup!! After 30 minutes add the orzo to the pot and let simmer for another 9 minutes. Once the orzo has cooked, add the kale to the pot and cook another 5 minutes. Yes, I know, traditionally spinach is served in this soup, but I have this beautiful bunch of organic kale in my fridge so I thought "why not!" I promise you, the kale will not disappoint. Taste for seasoning, make and adjustments, and you are finished! This soup is beautiful, vibrant, packed with flavor, and it is so good for you! It is the perfect meal for one of these cold, rainy, autumn nights. I know you and your friends and family are going to love this marriage of culinary delights, so get in the kitchen and try it TONIGHT! In a mixing bowl combine the ground beef, bread crumbs, Parmesan, egg, garlic powder, basil, parsley, oregano, salt and pepper. Using your hands, gently work the ingredients together. Add 3-4 tbsp of oil to a soup pot, over medium/high heat. Brown the meatballs for 2-3 minutes on each side. Remove from pan, and set to the side on a plate. Add the onion and celery to the soup pot. Add the carrots and garlic. Cook until the carrots start to caramelize or brown. Add the turmeric, basil, oregano, and parsley to pot and cook for 1-2 minutes. Add the dry white wine to the pan and reduce by half. Pour the chicken stock into the pan and return the meatballs. Bring to a boil, lower to a simmer, and cook for 30 minutes, covered. After 30 minutes, add the orzo and cook for 9 more minutes. Once the orzo is done, add the kale. *You can use frozen meatballs in this dish if you choose.